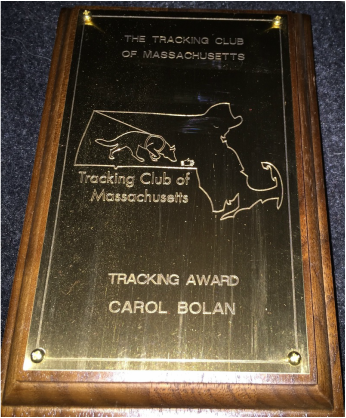 Each year the club awards members who have titled in a tracking venue a plaque and /or a dangle that attaches to the plaque. These plaques are presented at our annual awards ceremony , usually scheduled in mid-November. Dangles can be awarded for any tracking venue (AKC, CKC, or ASCA). Members who own German Shepherd Dogs and who title in any given year are eligible for the Ruth Ridings Memorial Trophy. 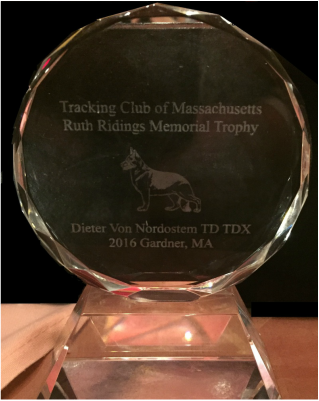 Non-members who own GSDs are eligible for the award if they title at one of the club's tracking events.